Christopher Nolan is a genius. Original science fiction is so rare that you should treasure it when you find it. The cast is stellar and the storyline intricately perplexing. Ariadne comes to the group young, fresh, and very talented. But she’s not naïve or easily fooled. She knows what she’s doing and keeps the others in line. Ariadne is the grounding force. Tina from Life is Good! Tina may think she’s scattered and unorganized. But she’s really on the ball and full of great ideas. One of the A to Z co-hosts, she’s behind the scenes keeping things moving. Nothing gets past her. Everything she does is for the best of the group and her blogger friends. Tina is that spark we all need. And messages, comments, and emails from her just brighten my day! Tina is originally from Sweden and is a writer and devoted A to Z Challenge Co-Host. In her posts, Tina often refers to someone called “The Engineer” – who is he? Did you know that in Greek mythology, Ariadne aided Theseus in overcoming the Minotaur by giving him a ball of red thread so he could find his way out of the labyrinth? H’s trivia answer – Hellboy’s father was played by John Hurt. 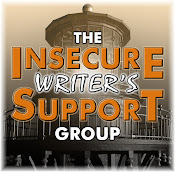 I am looking for co-hosts for the Insecure Writer’s Support Group for the next few months. If you can help by visiting twenty to twenty-five blogs on the list the first Wednesday of the month, please let me know. Thanks! Rachel Schieffelbein revealed the cover to her upcoming book, Secondary Characters, which releases May 28. Congratulations, Rachel! Fan of Inception and Nolan? Following the ever-awesome Tina? Can you help with the IWSG in the coming months? Excited for Rachel? Don't forget the giveaway at Goodreads and here! And can you believe a third of the Challenge is now over...? hi there, Robyn from Lifebychocolate told me about your blog. And I read about you there :-) I am definitely an insecure writer. Sign me up! Great movie, and great song choice! Gah!! You picked another movie I missed! It's a great one that one. I was dying to see Inception, somehow I missed watching it. Tina sounds like a wonderful person. Will be glad to help you out with IWSG. Inception is one of my all-time favorites, So smart and intricately plotted. And sure, you know I'll always help with the IWSG (Except for next month since I'll be in Arizona. Already entered your GR giveaway! I'll be happy when it's completely over. It's wearing me down. Although I have never seen the film, I listened to the song and it has great words. I'm sure Tina will be over the moon. Another excellent post and choice. Hi Alex .. Tina is amazing and I'm glad to be on her team .. she's always busy - but always has time .. and I'm certain she is a bright spark in the A-Z world .. Her Swedish posts are fun to read .. and the story line of her arrival in the States - can give us a greater insight .. Thanks for highlighting her .. I obviously need to get into the SciFi arena! I enjoyed very much the Inception. And the creepy shiphorn-feeling sound... Yay! I really want to see Inception. An excellent and very weird film. Hadn't heard the song before or even heard of the group!! Not a bad track at all! I loved Inception and Hans Zimmer's "Time." I would be mentioning the movie at least a couple of times before the end of the month on my blog. Inception is an excellent movie which I enjoyed very much. Tina is a terrific choice! She really does give her all on both blogs. I'll have to visit her again soon. I'm still in awe of all you do Alex! Am heading to watch Oblivion tomorrow, I hope it is good! Really interesting cover for Rachel's book. Great angle! I really liked Inception too. Great choice. Inception is a great film - although I am so disappointed in the younger generation of people I know who don't even understand it!! I can help you co-host IWSG Alex, just pick a month and I'll be there. Oh yes, Nolan was a genius for helping bring forth the unique science fiction prodigy that was Inception. I'm going to check Tina out and Rachel's cover is so wonderful. I've not watched "Inception" yet--but my son watched it. Unfortunately, he rented it while he was in bed suffering from a fever and...well, you can imagine his crazy dreams that night! I could help with IWSG in June or August if that's any help? School holidays are best for me as I can be around more! Haven't seen Inception yet, but I want to. Will check out Tina's blog! Congratulations to Rachel Schieffelbein! Congrats to Rachel! Tina is a wonderful choice for Ariadne. She is a great pillar of this community and is so supportive of so many. I love her blog and glad I met her through last year's challenge. Mark, had you on the schedule. And are you referring to the book? Cool. Nancy, just keep swimming as Dory would say! Hilary, her posts have been great. Ray, Dream Theater is one of the best prog rock bands out there! Elizabeth, I'm sure it was double the fever drams. Suzanne, that would be great. Love inception! And I call my hubby The Engineer on my blog. I wonder how many writers are married to engineers? Maybe it's a combination that really works. Tina is the tops and she sometimes forgets all that she contributes to us, her family and herself. I call her my sister, she would be welcome in our family, with open arms... great choice song to share. I am better knowing she has my back! I tried to watch Inception but I just couldn't get into it. My hubby and kids enjoyed it though. Christopher Nolan is a genius - you're right. And I love Adriadne's character. Inception was an intricately, phenomenal movie! I've watched it a few times. We love Tina! Such a great co-host. I really enjoyed Inception. The structure of that film was amazing!! Inception was amazing and even the ending played with your head. The Challenge has been quite a brilliant ride this year, so far, so good. Alex, Inception is onf my top-ten favorite movies of all-time!! I loved the originality and I loved the execution of the plot. Christopher Nolan is pure genius. You're the best. Thanks for your kind words, encourgagement, and general awesomeness! Now to listen to my song! LOVED the song. Perfect. iTunes, here I come! Jeremy, I'm sure she appreciates that. Tina, you are most welcome! We couldn't do it without you. I have yet to see Inception, but it's on my list. It gets made fun of a lot for it's intricate plot. The Engineer is Tina's husband, right? Thanks for sharing that song- loved it. I love Inception and Tina sounds like a great choice. Alex, I'm probably too late, but I'd be happy to help you with ISGW. Inception's special effects were awesome. Tina IS a great choice and the song is wonderful, too. Inception is still one of the best movies to come out in the past few years. Nolan is a genius. And I'd love to IWSG co-host if you need one. Excellent post, sir, as usual. I can't commit to co-host IWSG until maybe June. But, I would love to be able to help then if you still need it. Not a huge fan of Nolan, but I'll gladly start the day with a little Dream Theatre! I don't think I'll see Inception but I'll definitely check out Tina's blog. I was really looking forward to Inception but when I came to watch it I couldn't get on with it. Didn't really understand it I guess. I love reading Tina's blogs though, especially her current A to Z ones. Inception is a great film that made my head spin, as I'm sure was Nolan's intent. Thanks for all the work you do on the A to Z.
Ooo, Inception looks like a movie I'd love! Good luck with your Goodreads giveaway, I've found they do help bring in readers! Well, except that Inception was really just Dreamscape over again with just an added dream layer. Wasn't sure I was going to like Inception and then it blew me away. So good. I did know that about Ariadne. Theseus's conflict with the minotaur seems less heroic the more you know about how he pulled it off. And good luck with your AMA! I linked it from Twitter. Off to meet the ever-awesome Tina! Hope you are surviving this unexpected April Fool heat-85 today! With the Dark Knight trilogy and Inception, how can a movie buff not love Christopher Nolan? Loved Inception and everything about it, from the plot to the characters to the fantastic music. Christopher Nolan makes some pretty darn good movies imo. Congrats to Tina! Excited for Rachel, too. I'm gonna guess The Engineer is Tina's husband. I didn't like the ending of Inception which may seem ridiculous. Great picks for today!!! As always! And A to Z is one third of the way through -whoa! I can help in June for IWSG. A new blog to check out-- yay! Have a great day, Alex. Big fan of Christopher Nolan. I really like "Inception', but I have to admit that it took me three times through to get all of the subtleties of the story. Excellent choices. And yes, Tina rocks! Sign me up to host, Captain! It'd be a honour! I picked the same one for I. It was a really good movie. Why am I not surprised you picked Inception? I love love love that movie. Yes, I follow Tina and Life is Good. The funnest part about movies like Inception is listening to my house of men debate the believability of the science like a bunch of girlfriends picking apart run way styles. Dang! I knew that was John Hurt. Why didn't I remember when it counted? My brain is suffering from chronic AtoZness. 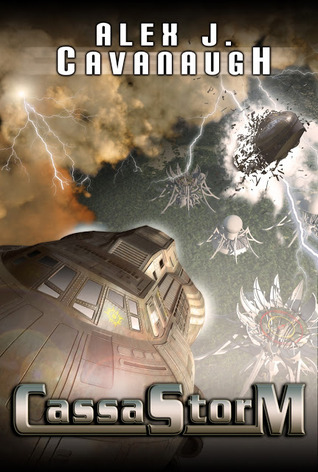 I read some of Cassa Storm last night---you are very talented, my friend! I'm enjoying it! Great giveaway! Inception is such a good movie, and I couldn't agree with you more regarding Tina! Off to go visit her now. See you in Blog Land! Alex! How can you talk about Inception without inviting people to voice their opinion on the ending? The ending sooo confused me. Is it a dream? Is it real? What is your opinion on it? I've heard both sides and became so hopelessly confused about it that I decided I don't know what it is. Ariadne is a great name for a grounding character. I love Inception. I could watch that movie again and again. And I was a lucky beta for Rachel and I'm super excited to see everything happening for her. Squee! Heather, I'll need help this summer. Bob, that works for me! Andrew, and much, much better. Ella, by hiding in the AC. Faraway, something new every time you watch it. Michael, it was real - he saw his kids' faces that time. Inception costed me quite a few brain cells to understand but in the end I liked it. Just met Tina because of the challenge, she sounds pretty cool. Hopefully AFTER the challenge I'll have time to read her more. Now, *IF* you return my dwarves unscratched I would be able to help you the following months. Up to you, sir ninja captain. I've yet to see Inception, but definitely want to. I've heard a lot of good things about it. I don't know Tina, but I'll have to take a trip over and check her out. Inception is one of those mind-blowing films that stays with you for a long time Alex. Adrian was an awesome character too, and deserves more attention so good job with that blogger highlight. A third? Time flies. A third of the challenge over! Phew!! It's been fun and I've come across some very interesting blogs! Nice cover on Secondary Characters. Yeah for Tina and being such a good organizer. I've been resisting the IWSG fro a while, thinking it'll be one more thing for my frazzled brain to wrap itself around, but having fallen in with your band of minions for the A-Z, I'll help you with visits. Just gotta go add myself to the list when I'm done here. Inception is definitely on my list of must see films! Inception was a great movie. Loved it. Congrats to Tina over at Life is Good. I have only been following her blog a short time and have difficulty keeping her people straight. I do love the Nicknames she has given to everyone, though. I think calling her mom The Nutritionist is hilarious. However, that wasn't what you asked. I think The Engineer is her Husband, but I am not sure of that. So many people in that story. I am glad she has a Main Page of people with a Who's Who. I refer to it sometimes when I get people mixed up. We have watched Inception at least four times. There are so many details we missed on the first or second go around. Inception is another great movie I need to re-watch at some point! Sweden? Very cool, I'll have to check her out. Well done to Tina - off to visit her now. I can help with IWSG if you like. Inception was the first, and only, movie my wife suggested we should see again. It was that good. And I would be happy to help you co-host the IWSG anytime you need it. Just let me know. i never think of Ariadne when i think of Inception, but she really is the grounding force of the group. i mean, without her, they wouldn't have saved Sato(??) at the end. and Dom wouldn't have conquered his demons. I see I'm late to the party. I LOVED Inception. The storyline, the drama. I don't always love sci-fi but this one I liked and would watch again! Inception is a movie I want to see, I've got it on my Netflix list! Can't believe I'm so late getting over here today. Love Rachel's cover! Yay for Tina! And yes, the Ariadne myth is one of my favorites. Thanks Alex, I haven't seen Inception but it sounds like a real treat! I've got to see it now. Al, unscratched but dying, is that all right? Maurice, time flies when you're busy! Joy, thanks! You won't regret joining the group. I can help with IWSG if you still need minions. What a sweet dedication to Tina. I love Inception so much. And since I still believe the entire movie happened inside Leonardo DiCaprio's head, I believe Ariadne is the part of his sub-conscious that is trying to wake him up. I am still impressed how well you are doing with your theme... Well done! I loved Inception. Getting to know Tina and she was a good choice for today. Yes, Christopher Nolan is a genius, excellent film. I don't recall ever seeing Inception. I will have to remedy that. Tina must be very organized to keep this massive group in order! Thanks Tina! I was so impressed with Inception, but now I really like the Greek mythology connection to the Ariadne character. Loved Inception - glad I saw it on the big screen. Would love to see it in 3D - the special effects were amazing! Inception is one of about six movies that changed my life. I'm not even sure why. I saw it and instantly wanted to become an engineer. The results are the landscapes, creatures, trinkets and devices I create for my stories. Excellent song choice, by the way. Your earlier posts have rekindled my interest in Dream Theater! David, they are an amazing band. Awesome choices. Inception is one of my all-time favorite films! This is my busiest week and I'm struggling to keep up wit the challenge. My kids love Inception and are always rewatching it. Inception, great choice. And Tina, great choice. I have the honoured privilege of interacting with the dear lady. 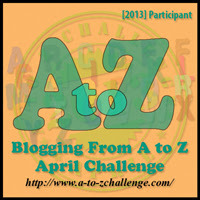 I'm going to see if we can meet at the halfway point of the alphabet challenge. "M", I wonder. I love Inception! I gotta watch that again. I'm still waiting for someone to explain Inception to me! Nolan is defiintely a writer I enjoy. Love the movie Inception. Awesome concept and definitely a mind-bender. 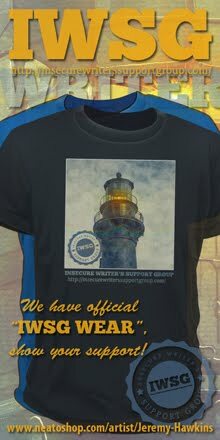 And, if you aren't already swamped with volunteers to help with IWSG just let me know. I'd love to help!! I watched Inception, twice, trying to like it. But, alas, I did not. I can help with IWSG, too. Just say the word. It's going by fast! I loved Inception. It was fun and dynamic. Awesome movie, great song and blogger choices! DL, the ending is real because he sees the faces of his kids. Karen and Tamera, thank you! I loved Inception. Brilliance. I disliked the end of it because I just didn't know if he was still in dreamstate or not. Ugh! It drove me crazy. Now I want to watch it. Inception was so new and unique I loved it from the beginning...and only got more into it as it went along. Can't remember if it left itself open to a sequel but I hope so. Inception was a great movie. There've been so many theories about the ending (ever read about Dom's totem not being his at all?) that I don't know which to believe. I'm definitely a Nolan fan! I waited a while to watch Inception, but I'm glad I finally gave it a chance. Like you said, it's rare to find original science fiction, and it was beautifully executed. I liked the themes of trying to differentiate between fantasy and reality (the end was perfect, imo). I loved Inception. I can't wait to read CassaStorm. One of my friends just told me he LOVED the second book even more than the first I'd recommended to him. Thought I'd share. :) He is anxiously waiting for the third. I lvoe movies about dreams, and this one is on the TOP! Inception is definitely one of my favourite films of the last few years. So brilliant. Totally willing to help IWSG--just let me know what you need help with. And Inception's a great one. One of those Matrix-style movies where I had to watch it twice to truly get it! 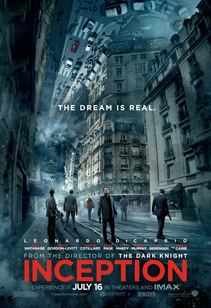 Inception - further proof that Christopher Nolan can do no wrong as a film maker.